China Evacuates Tianjin Blast Site As Sodium Cyanide Found : The Two-Way Wednesday's massive explosion in Tianjin killed more than 100; then fire broke out, and more explosions followed. Now Chinese authorities are clearing the area over fears of sodium cyanide poisoning. 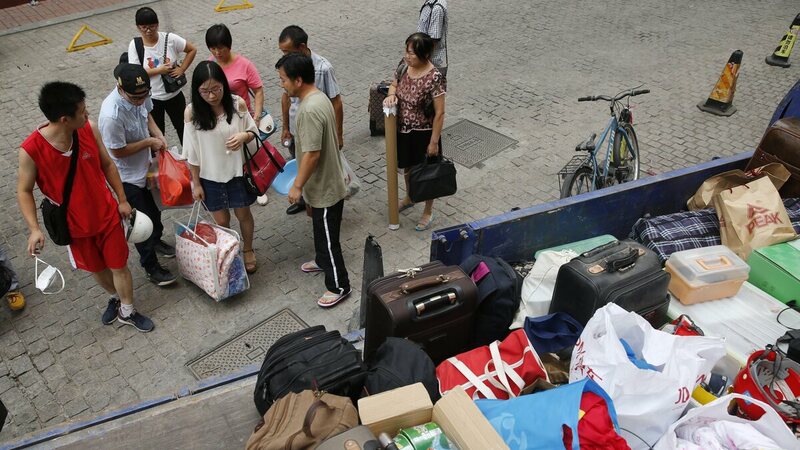 People carry their luggage as they are evacuated Saturday in the aftermath of a huge explosion that rocked the port city of Tianjin, China. Chinese police are clearing everyone within 2 miles of a fire in the port city of Tianjin over fears of chemical poisoning, days after a massive explosion that authorities now say has killed at least 104 people. Police confirmed that highly toxic sodium cyanide was present near the site, raising fears that spread of the chemical could cause more casualties. Fire broke out and more explosions were heard Saturday morning at the site of Wednesday's massive explosions. Searchers on Friday night uncovered more bodies in the warehouse district of Tianjin, state media reported, raising the death toll to 104. "Out of consideration for toxic substances spreading, the masses nearby have been asked to evacuate," Xinhua is quoted as saying in The Guardian. The People's Daily newspaper tweeted that anti-chemical warfare troops were "to handle highly toxic sodium cyanide discovered at #TianjinBlast site." The death toll includes 21 of the more than 1,000 firefighters who responded to the fire and blasts, according to The Associated Press. "There was no chance to escape, and that's why the casualties were so severe," the fire head said. "We're now doing all we can to rescue the missing." NPR's Robert Siegel spoke Friday with David Leggett, a consultant on hazardous chemical risk assessments, about the chemicals involved in the explosion and the ongoing risks they might pose. "There are three chemicals that are confirmed: calcium carbide, potassium nitrate and sodium nitrate. And those three together, if left alone and not in the presence of fire, are relatively stable. "However, in the presence of a fire — a very big fire, as we believe there was — the first thing that probably happens is that the containers of the calcium carbide probably start to fail; at the same time one can expect to see that the water supplies in the warehouse may be beginning to fail. And if we get calcium carbide — especially if it's hot — mixed with water, we form a very, very flammable and highly explosive gas called acetylene." Leggett said Chinese authorities — unlike their U.S. counterparts — may have lacked thorough documentation of the chemicals moving through the country's transit facilities, and that the detection of sodium cyanide in a nearby sewer could be concerning. "Depending upon the amount of sodium cyanide that is there, I would be concerned about the residues of sodium cyanide that may have been distributed across the area, and how that cleanup will be managed," he says.